Myntra, one of India’s most-popular online shopping destinations, has gone app-only. If you type myntra.com in your desktop or laptop browser, the site opens but only to ask you to download the app. No clothing tabs, no online cart. In a country, where roughly only 250 million users are on smartphones, many feel that by going app-only Myntra might has jumped the gun. However, Mary Meeker’s 2015 report on Internet Trends shows that e-commerce sites in India are getting close to 70 per cent of their traffic from mobile. So Myntra might not be wrong to take this risk. Issues of connectivity, payment security, even how the app and the clothing items will look on low-budget devices, have all been raised. An Economic Times report also said that Myntra saw a 10 per cent dip in sales after May 15’s app-only avatar. 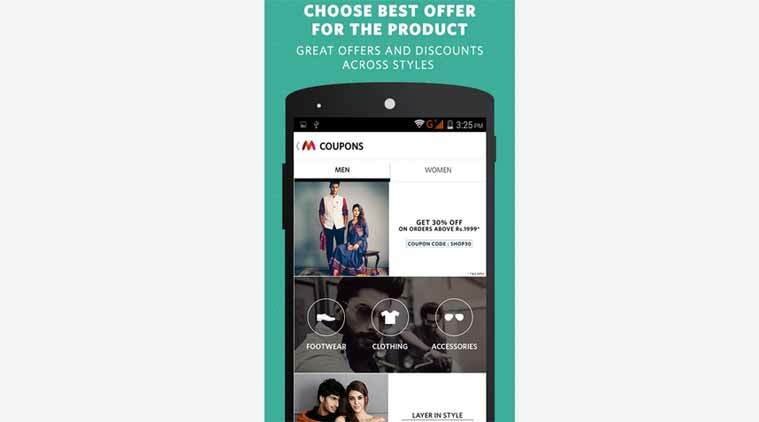 Myntra refused to comment on the same, adding that for now app-only is the way they are going. Traffic dip aside, online shopping for clothes in India has its constraints even if you ignore the technical ones. Myntra’s app ends up manifesting many of these. Where technical issues go, Myntra’s big ‘Appreciate yourself’ sale caused the app to crash. I downloaded the app once the site shut-down (no I was not a Myntra shopper before) and have been browsing the app quite regularly. I have to admit a part of this app-only experience has left me surprised, since so far I’ve avoided shopping for anything via an app. First the Myntra app. I’ve been using the iOS version of the app primarily on my iPhone 5c, which has a terrible screen thanks to numerous scratches. Does that affect how the clothes look on the phone? So far I don’t think so, and yes even with the scratches the iPhone has a stunning resolution. I’ve also checked out the app and similar clothing on the Android version of the app on Yu Yuphoria device which has quite a bigger 5-inch HD screen. In my opinion, the size of a screen will be crucial in whether a user decides to buy an item from the app. For instance since Yu Yuphoria’s screen is bigger and less scratchy, items appear to look really sharp. In a low-res screen with a smaller size, navigation will be a problem. So how easy it is to use the app? I would say that Myntra has some hits and misses here. In the iOS app there’s a “shop women looks” and “shop men looks section” in the middle of the landing page of the page. In the women’s section, there are several sub-categories which let you decide what item of clothing you’re looking for. From topwear, bottomwear, footwear, ethnicwear, etc, it’s a fairly comprehensive tab list. The list is organised differently in Android which is according to Indian Wear, Western Wear, etc. When you click on each of these sub-tabs, options under each heading show and you can just choose what you want. Dresses for instance come under topwear. It’s when you’ve finally decided on what clothing item you wish to browse, that trouble starts. The ‘Refine’ tab which lets users add filters from colours to brands to pricings is actually quite comprehensive. For a snap-and-buy shopper like myself, this comprehensive quickly turns into tedious. Given my preference for a few select brands, I found it a chore to keep scrolling down to get to them, while I tried to set a filter in my hunt for a dress. If you’re a brand conscious consumer, the app is feels like a special kind of hell. Perhaps what Myntra needs to do is prompt the user on whether they want to save their settings for a particular kind of item. Or better still just the show me the brands that I keep searching for again and again on the app. So it is easy to shop? Honestly, I did not think I was going to end up buying anything on the Myntra app. But I did, in fact on the third day of using the app, in what I can only describe as a classic case of ‘instant gratification’. Myntra’s app surprised me the most that day because a) it worked perfectly well on 3G in a place where I have faced network issues in the past b) I managed to register as a customer, placed an order, all in a jiffy. The app did not hang, the order did not fail and Myntra was fine with COD. c) I ordered a dress which was not from one of the big brands I usually rely on. Does this mean I’m likely to order again? Yes and no. The app in my opinion is a great way to browse for the brands I’m familiar with and won’t disappoint me. I’m happy ordering a t-shirt from say Vero Moda or a Mango from the app because I trust the brand. The reason for this brand consciousness because in the past I’ve ended up a black dress that looked nothing like black. In short, as a Myntra user, I’ve got a limited brand patience. And what about the dress I bought from Myntra? Well it looked much like what it did on the phone, which is a big positive. But it surely does not offer great quality as the silver finish on the buttons is starting to rub off in just two wears. So is online app-based shopping here to stay? Given the ubiquity of the smartphone in the lives of middle-class Indians, that’s a no-brainer. However, for most women and even men, shopping for clothes is a highly personalised experience. In some cases, it is driven by quirks, rigid preferences that even discounts like 70% cannot change. If e-commerce sites can move beyond the discount madness and satisfy more of those quirks, only then will the app-boom really take off.